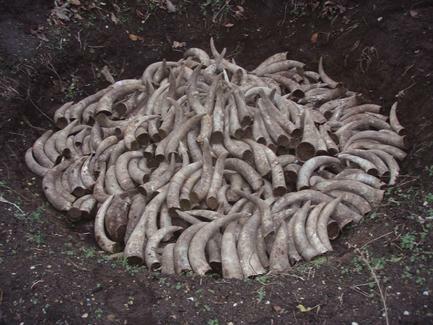 This is about 600 cow horns filled with cow manure ready for their Winter ''soujourn'' in the Earth. Over the Winter they will be exposed to the crysallization forces of the cosmic and earthly environment. The far planets Mars, Jupiter and Saturn charge the Earth's silica with fruiting and growth energy. This comes into Earth through the 'etheric stream' from the east [like the three wisemen in the Christ story]. Notice that all the openings of the horns are facing in one direction, to the east, to capitalize and capture this energy. The horns will be covered with the soil surrounding the pit. They remain in the earth from the Winter solstice until at least Ascension Day when they will be dug up and emptied, their contents stored in a root cellar environment. This will make about 35 gallons of bd500. Applied at 1/4 cup per acre after being stirred in water this will be sufficient material to treat 2,240 acres! Click on the images above to enlarge and for description. In the "Spiritual Foundations for the Renewal of Agriculture", or the 'Agriculture Lectures' Steiner lays the foundational groundwork for what became known as "Biodynamic Agriculture". Many of the indications were only tried for a couple of years before giving the course and Steiner recommended experimenting with different procedures and 'individualizing' the process to the farm and the farmer. One such indication is in the making of the compost preparations bd502-bd507. The yarrow preparation, where the flowers of yarrow, Achillea millefolium get packed into the bladder of a stag [a male or buck deer] and hung up in the summer sun before being buried in the earth for the fall, winter and spring. Steiner states that we may also want to try this on the chamomile [bovine intestine] preparation as well as the dandelion [bovine peritoneum or isles of mesentary] and oak bark [bovine skull, meninges]. 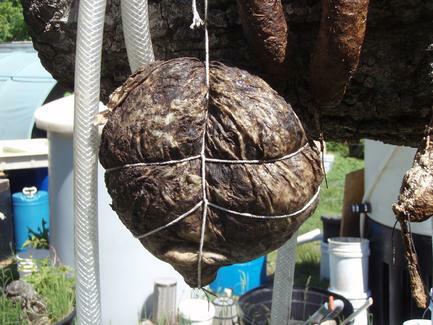 I have tried this out several times and find that the preparation finishes more consistently and completely by hanging in the summer sun before the fall, winter and spring burial. These preps are dug up on Ascension Day, which is spiritually symbolic and energetically beneficial to the preparations as it is tied to the cycle of the year and the "Christ Energy/ Impulse". 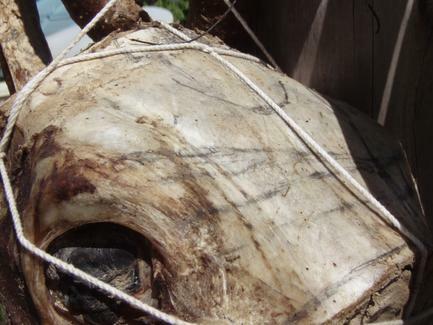 The photo above shows the sinus cavity after removal of the horns from the bovine skull to more easily bury it for the oak bark preparation. This is from the female of the species, the cow. It was very interesting to see this. The sinus goes up into the horn and connects the nose, eyes, ears, horns, throat, mouth / pallet. 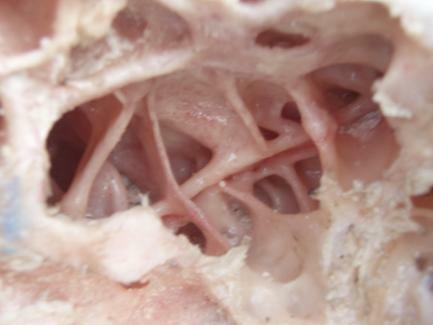 The cows brain is encased in this sinus cavity giving it complete sensory contact with its environment. When the cow is chewing its cud it moves its food through the four stomachs and it is constantly exposed to this nerve-sensory system. 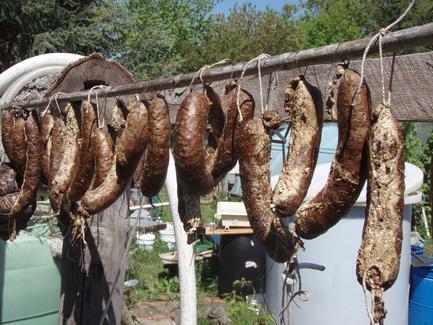 This is the energy that enlivens cow manure and makes it such an excellent and superior plant fertilizer. In this way the manure is made 'sensitive' to the cosmic environment and imparts that into the plant.